These are the easiest to set because there is very little your opponent can do to impact your ability to do so. The “must be 9 away” restriction is fairly universal, so beyond a warp time or similar movement ability, you can plan ahead and keep your opponent in check. 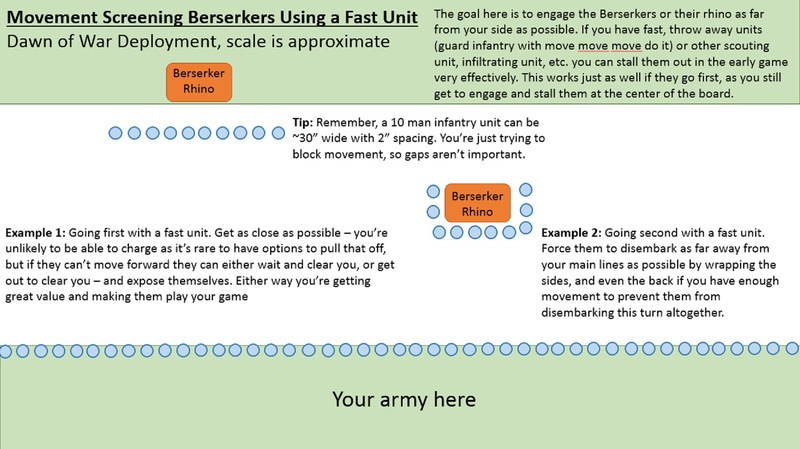 For this function, it’s good to include some backfield or infiltrating units in your army, position your characters carefully, or just string back models from your core units. Remember, you can leave 9” + size of the unit behind you, or 18” between your units, to block a zone. Blocking a backfield is generally fairly easy, but zoning out your flanks in other deployments requires a little planning ahead. 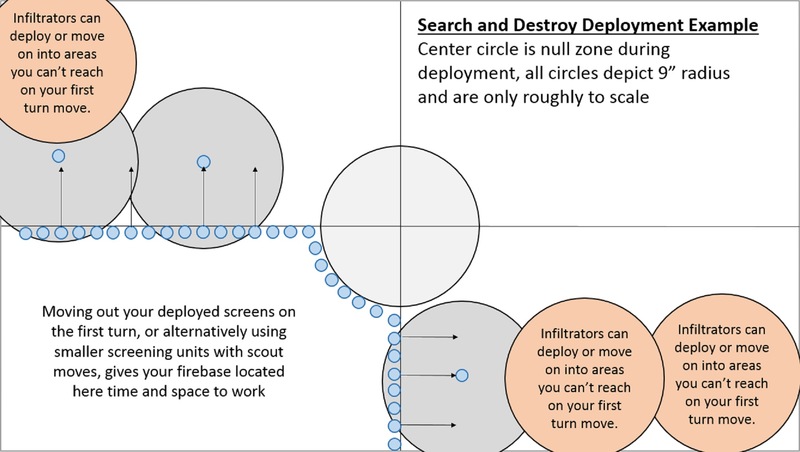 Search and Destroy (Table Quarters) and Vanguard: Try leaving a unit you want to move near the short-edge side of your deployment and on turn one, move it over into that corner – you can also do this with an infiltrating unit like scouts, nurglings, or ratlings. It helps block out your pseudo backfield so you can apply forward pressure and not have to deal with getting flanked. What if I like to do a refused flank (concentrating units on one side of the board)? That’s fine – nothing stops you from doing this, just make sure you have a trash unit or two that you can still set over in the portion of your deployment zone you don’t plan to occupy so your opponent can’t set up his homestead on it. It’s turn 2, where’d my screen go? Your opponent, if they’ve based part of their strategy around reserve shenanigans, isn’t probably appreciating the fact that you’re screening him out. His goal is now to clear your screens so he can bring in his reserves. So, make sure you have plans for how to reset your screens. 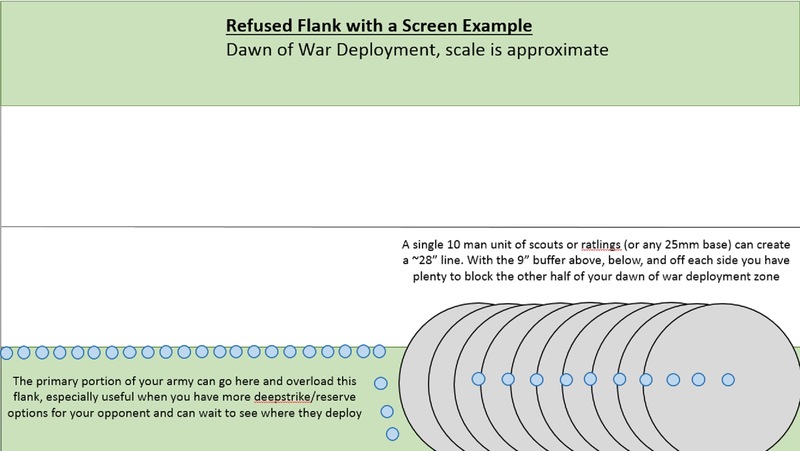 Either more of the aforementioned units, or by moving up other screening/blocking units that while they couldn’t block on turn 1 due to being forced to deploy normally, can now move up on turn two to replace the last batch. This is very hard to do and requires a veritable horde against units with fly. It’s generally not worth it and usually doesn’t work very well if they have fly or can otherwise skip your models, as you have to block out an entire zone of movement instead of just placing a wrapping conga line around someone to give them a nice hug. You want to thrust the unit as close as humanly possible to your opponent, but you can leave 2” gaps when you make your lines because they can’t move within 1” of an enemy model – this will change for assault screens. I’ll commonly do this with my guard units using “Move Move Move” and Move/Advance then Move/Advance again. I’ve done this to Khorne Berserkers, especially if they haven’t disembarked. Basically, I’ve forced a turn where they need to get out ~24” from me, and guaranteed myself an opportunity to shoot them prior to them charging into my backfield and hitting multiple juicy targets. You can do this via assaults if your opponents gets close enough to allow you. Frequently you’ll be better off guaranteeing they start d6” further from you by advancing, but sometimes they’re close enough that you can move and get off a reasonable 6-7” charge. If you’re going for this, remember to stay 1” away from them when you initially charge, then use your combat pile-in’s of 3” to slide around them and box them in, all while getting fractionally closer to the closest enemy model. It’s also a great way to rope other units into the combat and prevent them from charging in the following turn. Don’t use this against units that are going to clear you or do a ton of damage. Against khorne berserkers you just stand right in front of them and force them to charge – it’s not worth giving them a free round. Acts of Faith—This is one I’ve used frequently in my lists. Since you can nominate a unit (or more depending on inclusion of Celestine, Imagifiers, etc.) to fire before the movement phase, you can effectively kill a screen prior to your models moving or deepstrikers coming in. This has been especially relevant for me as opponents will set fairly cheap, easy to kill screens and I’ll use dominions or other units to fire before my movement phase and clear them, allowing my plasma to come in and hit targets they thought were safe. Jump Units—This one is pretty simple – people will try top over your screens, meaning you need to block more area then just a line. You *can* do this, it just requires more models to block jump units. If you don’t have enough and just want to slow them down, measure out their move and the size of their base, go as far forward as you can while not leaving room for them to place past you. You can still push them back a fair bit by doing this, even if it’s by no means perfect. Warp Time/Other Similar Powers—Generally used alongside jump units, units moving twice (especially units like Magnus which now have a movement of over 30 inches) are pretty hard to screen. Your best bet is to give up on wrapping/obstructing their movement/deployment, and instead just try to buffer out their charge target so they can’t engage it in the first round. Remember to plan for their end of combat pile in when you pull casualties so they can’t slide in to prevent your key unit they’re targeting from shooting.